– No gatekeepers. The web is decentralized. Anyone can start a web site. No one has the authority (in a democracy, anyway) to stop you from putting up a shingle. Of course, we live in a society of law, so if that new site breaks a law, well, you might have to take that shingle down. That’s OK with me. – An ethos of the commons. The web developed over time under an ethos of community development, and most of its core software and protocols are royalty free or open source (or both). There wasn’t early lockdown on what was and wasn’t allowed. This created chaos, shady operators, and plenty of dirt and dark alleys. But it also allowed extraordinary value to blossom in that roiling ecosystem. Over time, the good actors have come to agree on best practices which have allowed an extraordinary new resource to thrive. These practices include privacy policies, data use policies, and even some reasonable law (we’re still working out a lot of the law part, but it’s happening slowly and with consideration, as I believe it should). In short, we’re taking the time to codify the rules of the road on the web. We’ve not pushed it into early lockdown in terms of policy. The same is absolutely not true of AppWorld. – No preset rules about how data is used. If one site collects information from or about a user of its site, that site has the right to do other things with that data, assuming, again, that it’s doing things that benefit all parties concerned. If it does stupid things, that site will be called out, and folks won’t visit it anymore. Yes, some people may get burned, but on balance, we’ve decided that it’s better to allow sites and their customers to determine the best use of data, rather than pre-determine data policy to the point where innovation is stifled. This is something of a corollary to my point above, but it bears explanation. Here’s one small example: When I watch a movie on Netflix using its website, Netflix stores information about how I watch that movie. If I stop watching and leave the site, Netflix remembers where I stopped, and gives me the option to resume the next time I go to the site. And if I fire up my iPad and launch the Netflix app, it also remembers where I was – because you can import data from the web into Apple’s AppWorld. But if I start watching a movie in AppWorld, then go to the open web to continue watching it, I can’t resume the movie. Netflix doesn’t remember what I’ve done on its iOS app. Why? Because in AppWorld, data can come in, but it can’t go out. This stifles innovation in so many ways I’m going to have to write another post to explain it. – Neutrality. No one site on the web is any more or less accessible than any other site. If it’s on the web, you can find it and visit it. This is a corollary of “no gatekeepers,” but again, it bears elucidation. In current versions of AppWorld, finding anything is a challenge, and the winners are almost always those who get special treatment in a gatekeeper’s storefront. – Interoperability. Sites on the web share common protocols and principles, and determine independently how to work with each other. There is no centralized authority which decides who can work with who, in what way. In AppWorld, the apps don’t talk to each other, and from what I can tell, you need permission from the gatekeeper if you’re going to work around that fact. Again, this stifles true innovation. Imagine if Google needed permission from some overlord to crawl the web back in 1998. It would never have gotten off the ground, and the second great Web boom may never have happened. I’m sure I’ve missed a few key points, but I think you get the picture. If Colony’s “app-internet” sheds the crappy parts of AppWorld, and keeps the best parts of our current Web, I’m all for it. But if the reverse happens, I’m all in – against it. Long live the web! No gate keeper, interoperability, neutrality: that’s what’s sorely missing from the latest services like Facebook, Google+, Instagram and the myriad of sites who want you to generate content for them and keep it locked in. I am still hoping that standards will emerge that allow basic social sharing “the internet way”. I actually agree with most of what you said (and wholly disagree with Benoit) in the core principles of what makes ‘the web’. You do reference the ‘exceptions’ and ‘asides’ to those principles, but as a whole, pretty spot on. but to the point of your article, I feel the ‘appworld’ scenario is only going to serve to help ‘evolve’ the www. As the various languages have served to further improve elements of the core principles, I believe in turn, so will the concept of ‘apps’ as we know them today. Now John, that’s what i call inspiring words. Well done! And yes I agree with you. And Benoit (below) we are indeed prisoners on small puffy clouds. We are still at the beginning of this thing. Odd, I’m not sure you guys are disagreeing with each other. I am hoping AppWorld is a fleeting and instructional era, not a longstanding one. Thanks for addressing the topic! You bring up some interesting points, perhaps a beacon of hope! I only wish there was significantly more debate about this shift in form. If we don’t solicit input and debate, it ultimately becomes corporate strategy. 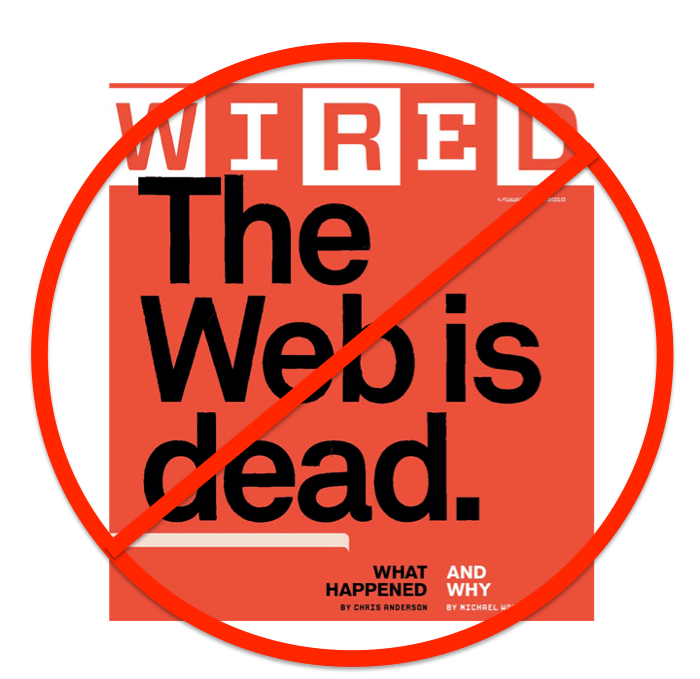 Frankly, I see nothing wrong with the web “dying”. The web is HTTP inside of a browser. To me, that’s archaic. Free the web from the browser, and turn it back into the Internet. As Benoit already pointed out, even when you’re dealing with web “applications” such as Facebook, Google, etc. you encounter closed, gated systems (e.g. Google doesn’t let you remix its results, or substitute a different ad network in place of its own, Facebook doesn’t let you export your social graph, etc.) So being in a browser is orthogonal to the spirit that you’re outlining, John. I agree; I say that we should retain that spirit. But let’s stretch our boundaries of what the Internet (not just web) is, beyond the confines of a browser. I’d much rather live in a future of native-written, internet enabled applications, than one of browser-limited, sandboxed-to-the-host-website (e.g. Facebook/Google) browser applications. The web is certainly not dead and working very healthily !! 😀 I would still vouch for the web being very much alive!! In WebWorld, the apps don’t talk to each other, either. A window in Firefox doesn’t talk to a tab in Chrome. This is actually a good thing, if you’re trying to get around the NY Times’ monthly 20 free articles paywall. Conversely, in the non-iOS AppWorld, with Linux-based multitasking and PDKs that give you OS-level access, all of the familiar IPC mechanisms are there for anyone who wants to share. In single-tasking iOS, of course, there’s nothing running except yourself, so there’s nobody to talk to. It’s about points of control – the key is, do we have a framework in which the individual – you and I – can mitigate what you describe as a problem below. In many circumstances it’s out of our control. Alive and always thriving …web and web activity is very much here to stay . Being in a accommodation sector (I work in http://www.palmgreens.in) which is very much present in the web and much of its revenue also comes from it. So yes …I will go too for web to be alive ! Google is not dead however they are certainly loosing is luster. They are blind to people gaming them as an example I offer this. I searched today for gold IRA company reviews and this regal assets firm is gaming Google good. The first 35 results are all the same company with a different URL. That is the end of Google for sure.